Vital records of Waltham, Massachusetts, to the year 1850 (Boston, Mass. : New-England Historic Genealogical Society, 1904), Marriages, page 205, Samuel Pierce and Mrs. Abigail Stearns entry. Samuel Pierce (1712-1772) was the son of John Peirce and Elizabeth Smith of Watertown. He married Abigail Stearns (1715-1798) on 30 June 1739 in Watertown, and they had nine children. Abigail was the daughter of George Stearns and Hannah Sanderson of Watertown and Waltham. I was concerned that the record said "Mrs. Abigail Stearns," which implies that Abigail had married a Stearns before she married Samuel Pierce. However, George Stearns will clearly identifies his daughter "Abigail Peirce." 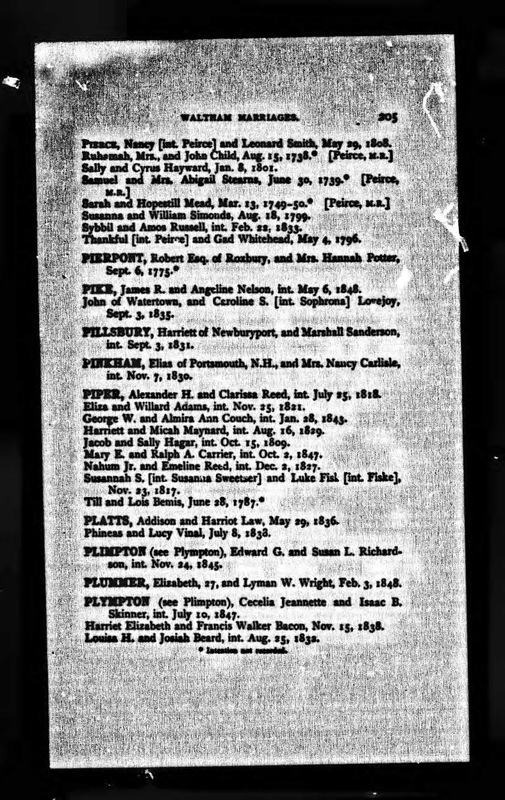 Both the Bond Watertown genealogy book and the Stearns family history book state that Abigail was the daughter of George and Hannah (Sanderson) Stearns. Why did this happen? The record includes [Peirce MR] which indicates that there was some sort of Peirce family record - perhaps it was a family Bible in which that a family member made the seemingly erroneous entry. There are no town records in Waltham or Watertown for Abigail's birth, baptism, marriage, death or burial. Samuel and Abigail (Stearns) Peirce are my 6th great-grandparents. I am descended from their daughter, Abigail Peirce (1750-1776), who married Jeremiah Knowlton (1745-1785) in 1771.